Logan Huff won a Pro-Am championship while running the GBC Ground Buster III tires, and he has no plans to use anything but GBC Motorsports tires. The cornering master — By the staff of Dirt Wheels. 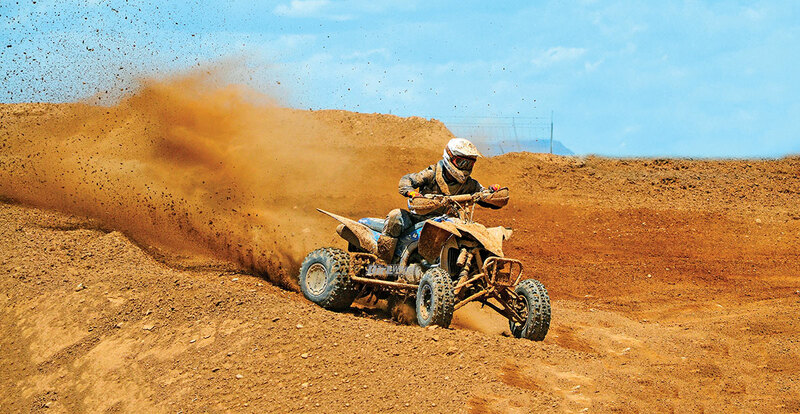 GBC Motorsports has a vast lineup of great ATV and UTV tires. One of our favorite sets for sport quads is the XC-Master. The fronts have excellent traction and point our machines in the right directions. 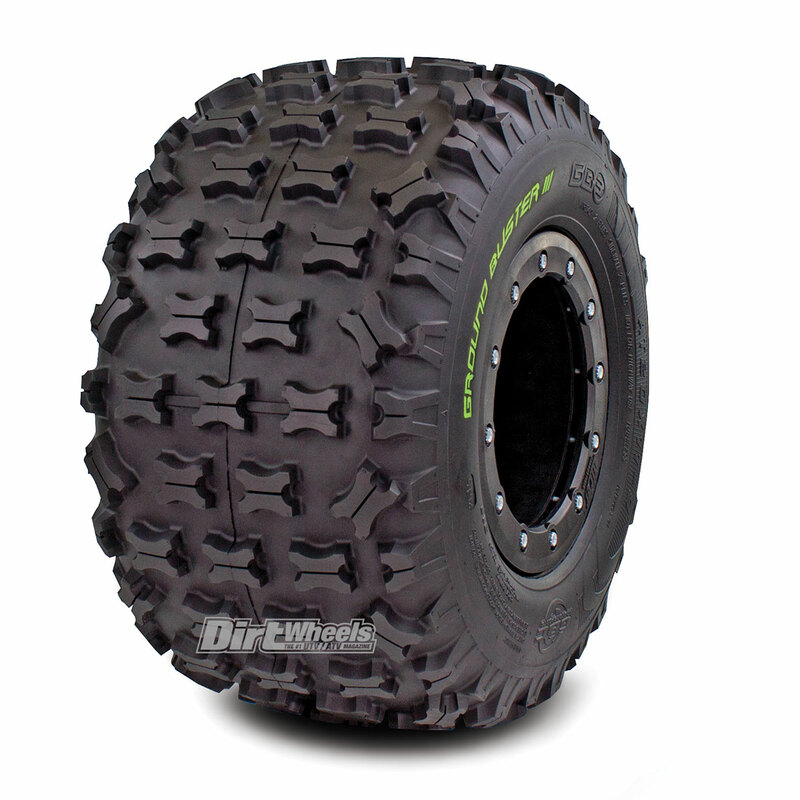 The rear XC-Master has an awesome amount of traction and works very well in many different types of terrain. Our only confession about the tire is that the side lugs provide too much traction in corners for some terrain. GBC must have read our minds when they released the Ground Buster III rear tire! GBC provided a new tire that has a more rounded side-lug profile that still gave us tons of straight-line traction! We decided to give these pieces of rubber a long-term test through many Grand Prix-style race-courses with all different types of terrain. The Ground Buster III has a flat profile with X-knob lugs and rounded side lugs with an overall diameter of 19.7 inches. The GBC Ground Buster III rear tire has a flat profile on top and then rounds out near the sides. The center tread blocks are X-knob styles that have been proven through the years to work very well by many different tire manufacturers. The side lugs of the Buster are offset every other lug. The tire is non-directional and is offered in two different ply ratings. The two-ply Ground Buster is good if you ride in areas that aren’t filled with trail debris that causes flats easily, but they are great if you plan to run a flat-prevention system in them like Tire Blocks or Tire Balls. The six-ply version of the tire is more durable and resists getting flats better, but it weighs more than the two-ply. The weight of the two is 14.9 pounds, while the six-ply is 15.5 pounds. To put that into perspective of the XC-Master, it weighs 16.9 pounds, which puts a tiny bit more stress on your suspension, engine and transmission. The overall diameter of the Ground Buster III is 19.7 inches for a claimed 20-inch-tall tire. The benefits to this are that you get traction quicker and you can accelerate faster. You do lose close to 1/8 inch of ground clearance in the rear over a true 20-inch-tall tire. The Ground Buster III is suited for intermediate to hard terrain, and that is exactly the abuse we put it through for miles of riding and racing. Well, of course, we love to go fast, so the first test was straight-line traction, and these GBCs hooked up instantly! The smaller diameter gave us a little bit more go off the line, and since they aren’t that heavy, our TRX450R felt comfortable spinning them. Next, we turned them through many corners, and this is where we feel the tires really excel. Since the side lugs are more rounded, they didn’t catch and try to stop the tires from spinning when they got in contact with ruts and rocks. This allowed the tires to roll over the patches and keep the Honda pitched in turns where we needed it to. 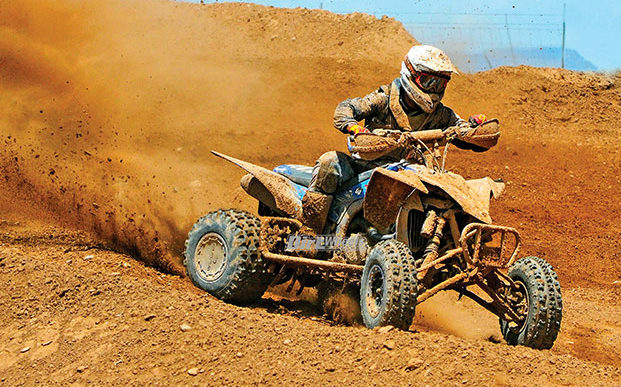 When riding a deep, dual-track rut, the Ground Buster III felt like it utilized more of the tread than a tire with a wider tread pattern to pull us through the turn. Our test rider felt like he was able to actuate the throttle easily and keep the rear end of the quad in control while laying down more power. When it comes to riding through mud and sand, that is where we feel the GBCs fall a little short. The tire still claws through the terrain, but not quite as easily as a tire like the XC-Master might perform. The other minuscule downside is that you lose a little bit of ground clearance, but that didn’t seem to matter much to WORCS Pro-Am Championship winner Logan Huff, who raced the 2017 season through courses in Nevada, California, Utah and Arizona with them. All of these locations involved either sand, mud, rocks, asphalt, hardpack or wooded sections. The Ground Buster III is a great all-around tire that has a lot of benefits. We know that it may not be perfect for every terrain, but it can be used on a wide range of surfaces, and honestly, there is no such thing as a perfect tire. We dig that they are lightweight and corner very well while providing excellent traction. We tested these tires until they had no more life left in them, and they are at the front of the pack. The 20×11-10 2-ply tire runs $99.94, while the six-ply goes for $102.96. Go to www.gbcmotorsports.com to find out where they are sold and to check out their extensive ATV and UTV rubber lineup! 2019 Honda Talon, It’s Real! 2019 DIRT WHEELS IS HERE!